From the very beginning, I knew I wanted to create a mommy blog – I just didn’t know anything else. I mean, first of all, what on earth was I going to call this blog? This type of thinking is common among new bloggers, but down the road I came to realize that choosing your blog name shouldn’t be step one. In retrospect, I feel as if I could have spent more time brainstorming before running with the name. Initially, my corny sense of humor led me to create a blog called, “Thismomisdabomb.com.” I bought the domain name and ran with it for over a month. However, deep down inside I was never fully satisfied with the name. It wasn’t until I attended a few Social Media Week 2015 events in New York when I realized, “I’m doing this all wrong.” I ended up rebranding my blog to “Diaper Etiquette” (www.diaperetiquette.com). Rebranding is not only a pain, but also time consuming – try to avoid it at all costs! I’m writing this post today as an attempt to prevent you from making the same mistake I made. Is your blog name easy to spell? Words that are easy to spell are often easy to remember (e.g., http://www.mombloggersclub.com). I actually have a beauty blogger friend who named her blog “Beaute Par Michele.” Unfortunately, every time people would hashtag that name on Instagram, they would end up spelling it wrong. She eventually changed her blog name after realizing how many people kept misspelling it. Can readers tell what your blog is about? You’re at an advantage if one can tell what your blog is about just from the name alone. If not, you will need to do an amazing job branding your name. 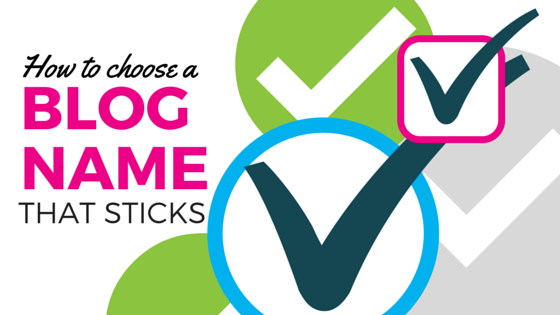 Does your blog name match your domain name? If your blog name is your domain name, it makes it easier for your audience to visit your page. For example, for those who want to visit Diaper Etiquette, all they have to do is plug http://www.diaperetiquette.com into their browser. It’s easier than typing in a URL such as http://www.diaperetiquette.wordpress.com, or even trying to find out what my blog URL is. Does your blog name have staying power? Keep in mind time and relativity. Try not to pick a blog name that will be outdated in the future. Define the tone of your blog. Is it funny? If so, then think of funny blog names. Blog names can hint at the writer’s personality. Make up your own words. Sometimes creating your own word can make interesting and memorable domain names – e.g., YouTube, Instagram, etc. Tools like Wordoid can help you come up with fun and funky domain names. Try thinking of puns. For puns, think of phrases and try to replace words within that phrase with rhymes. For example, maybe someone is a travel blogger, and they’ve selected the phrase “There’s no place like home.” They can plug the word “home” into Rhymezone and look through the suggestions. An end result could be something like, “There’s no place like Rome,” or www.theresnoplacelikerome.com. Just write words down. Nothing can ever replace the traditional brainstorming method of writing things down. Try thinking of potential blog topics. Also, write down any word relevant to your blog expertise. You can also write down ideal characteristics of your audience. Which words appeal to you, and which ones don’t? Circle and cross out specific words, then work from there. Research across social media. Nothing is more disheartening than thinking of the *perfect* blog name, only to realize someone has already thought of it. Not only should you search potential blog names via search engines, but look them up also on social media (Instagram, Twitter, Facebook, etc.). Research to avoid legal matters. Try to avoid having names too similar to ones out there already. Also research other potential copyright and trademark issues. Research similar blogs. Maybe you can find inspiration from other similar blogs. See what type of content other blogs within your expertise are putting out there. Days and days of brainstorming can really burn you out. Try asking close friends and family members what they think. Usually if someone responds enthusiastically, I put that idea on the top of my list. I also ask why they think one suggestion is better than another, or why they don’t like certain suggestions. It’s good to consider other opinions, especially because they can see things or potential problems you are not yet aware of. 5. So why did I rebrand? During Social Media Week 2015, I attended Quantifying Fashion’s Love Affair with Instagram. The event shed light on the fact that I wanted a fashion-savvy audience as my main demographic. Then another event made me realize viral content is content most people can relate to. My blog before I rebranded was personal, and therefore not as relatable to others. I decided I wanted to create a community, one where people interacted with each other versus an audience just listening to me talk about my own life. Diaper Etiquette is more a lifestyle and community of fashion-savvy parents. Thismomisdabomb.com was more a blog about my own life and what my own child wears. 6. What troubles did I go through? From rebranding, I had to call my Web host company and change my domain name. Unfortunately, my Web host did not allow me to simply change the name. I ended up buying a completely new domain. On top of that, I had to recreate my logo. As soon as the logo was recreated, I had to update all my social media accounts with the new name and logo. Last, I updated a few of my blog posts that still mentioned my old brand name. Some people wondered why I rebranded, but I tried to make the transition as smooth as possible. I never really explained why I rebranded to my audience – I just let it happen. The great part is that my audience was still small when I made this switch. These type of mistakes are better to make in the beginning versus when you have already established a large audience. this write-up very forced mme to check out and do so! Your writing style has been surprised me.